As I walked The Dog in Osterville’s Armstrong-Kelley Park today I couldn’t help but notice how dry everything is. The paths were dusty under the pine needles and oak leaves. In fact, the oaks have shed their foliage much earlier than normal and they have been dropping leaves at the same time as the birch and maples. Drought stress is most noticeable on the Rhododendrons, however. Their leaves are curled and many show abnormal fall color…they are shedding foliage that they no longer have the root systems to support. People don’t consider that dry soils cause a plant’s roots to dry up. When that plant no longer has the root system to support all the stems and foliage above it will begin to jettison what it no longer has the root system to maintain. Right now we’re seeing early foliage loss, but we’re also likely to discover more winter damage and even loss of growth or bloom next year. Most spring and some summer flowering plants make their flower buds in the summer of the preceding year. So our Rhododendron, Lilacs, and Viburnums, for example, have already formed the germ of the blossoms for next season. If there’s a late-summer and fall dry spell as we’ve recently been in, those buds can shrivel. Attention Cape Cod: if your spring flowering plants don’t bloom as you are expecting in 2014, blame this year’s drought. And let’s not even mention the big-leaf Hydrangeas. They have their buds formed now, and many have been in drought stress for at least three months. No hydrangea flowers? It’s a Cape Cod Nightmare! Trees can sometimes demonstrate the effects of drought two or more years into the future. If a tree has been stressed by drought it’s more likely to succumb to other problems such as insects or disease attack. Often when we see a tree die it isn’t just one thing that’s killed it…it’s a combination of problems and drought is a prime contributor. At this point in the fall, what can the homeowner do? If possible, delay the shut-down of irrigation systems and be sure to water shrubs and trees deeply once a week. Keep the water on for longer periods than normal; I can’t tell you the number of properties I’ve been on where the homeowner says, “Oh, these plants aren’t stressed…I have irrigation.” I ask these people for a trowel and demonstrate that four inches down their soil resembles moon dust. Most irrigation systems don’t water deeply enough, and in times of drought it’s difficult to keep areas saturated even when you run the sprinklers or soaker systems for longer periods of time. To my mind, however, the most important thing that we gardeners can do is keep our eyes and minds open. When it comes to the natural world there are times when there is nothing we can do except bear witness. If we make note of this dry period we can at least know what might be causing problems that we see next spring and summer. And we can pray for rain. We usually don't see so much color on Rhododendron at this time of year. 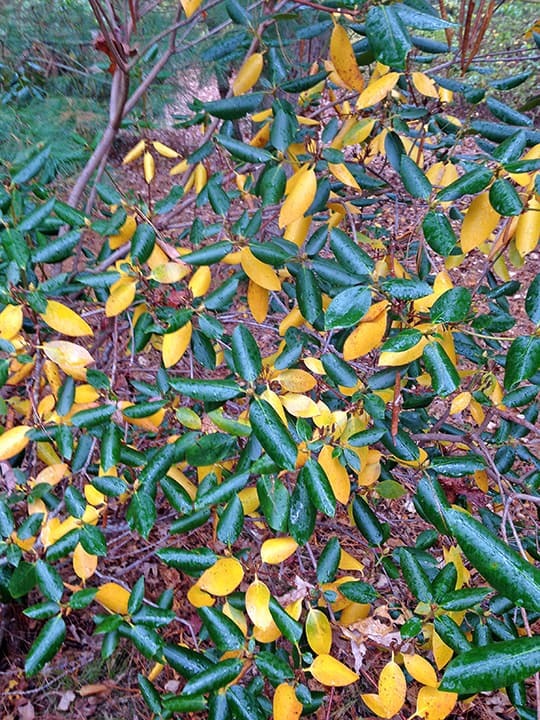 It's more common for our rhodys to lose winter damaged leaves in the spring, but all over the Cape I notice red and yellow leaves now. These plants are thirsty, thirsty, thirsty. 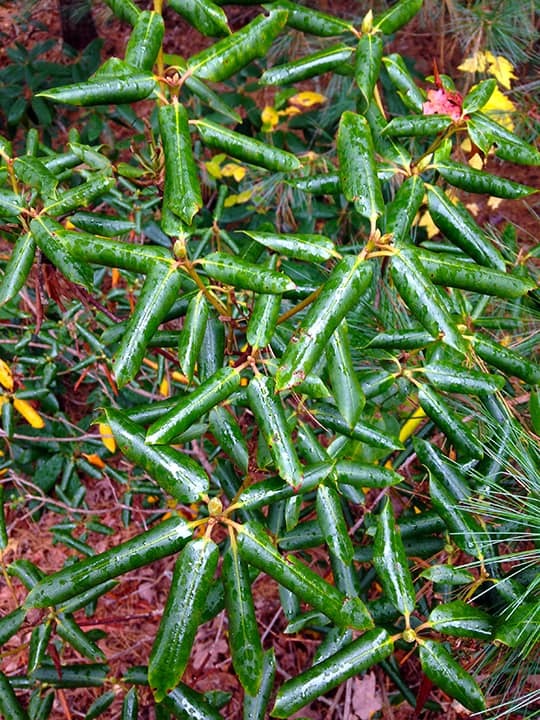 We also see Rhododendron leaves that are curled, similar to how they appear in very cold weather. These shrubs aren't chilly, however, they are dry.